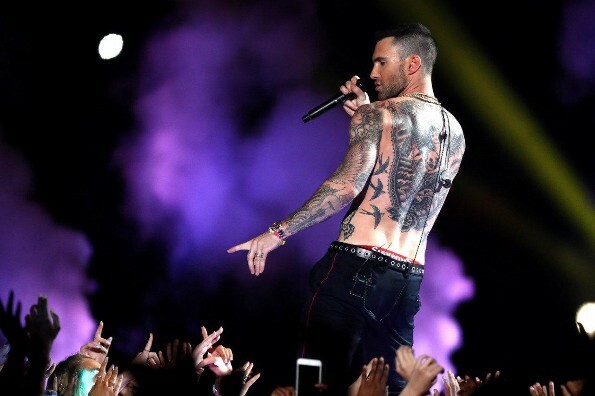 Siguiendo los pasos de Michael Jackson, Beyoncé, Lady Gaga, Katy Perry, Bruno Mars, y muchos otros artistas que se han presentado en el juego más visto del mundo, Maroon 5 empieza el medio tiempo con canciones clásicas como ´Harder to Breath´, ´She will be loved´, ´Animals´, ´This Love´, seguido de los raperos Travis Scott y Big Boi con ´Sicko Mode´ y ´Kryptonite´. También hicieron un cover de la canción de Outcast ´The way you move´ y cerraron con broche de oro con ´Sugar´. This animation at the start of @travisscott’s set was definitely the highlight at the #SuperBowl half time show. Oh and @BigBoi’s fur coat. Who agrees?